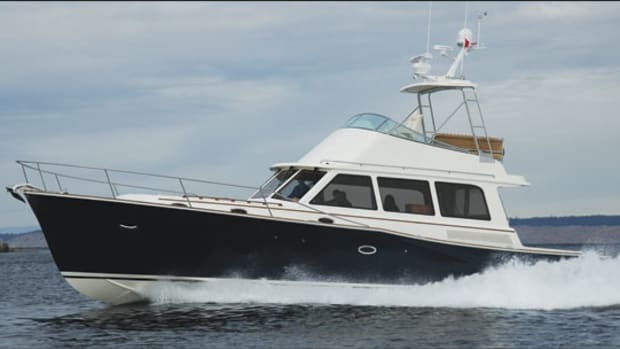 Hampton Yachts offers a salty combination of comfort, elegance, and blue water capability in the Endurance 720 Long Range Cruiser. Any boatbuilder worth his salt knows that success lies in the fundamentals of design and construction. Falter there and no amount of backfilling will save the day. But dial in all the critical points and a promising foundation can be laid. Hampton Yachts nails the fundamentals with this addition to its proven Endurance Series, the 720 EN. To gain an appreciation for this big-shouldered cruiser, you need to go way back to the beginning, to the time when the tooling sat empty in a construction bay, fastidiously cleaned and polished, ready for that first layer of gelcoat. Then, you need to follow the building process, hallmarked as it is by a precise and intense attention to detail, start to finish. You need to understand the sumptuousness of the accommodations that are being carefully fitted into the interior, the array of redundant systems that are being installed in the engine room, and the seakindliness that&apos;s been designed into the hullform, with a running surface that will take you virtually anywhere you want to go. A partnership launched the Endurance Series. Visionary boatbuilder Jeff Chen, the scion of a Far Eastern marine-industry family, joined forces with Capt. Forest Roberts, a long-time veteran of the marine industry and the guiding force behind Ft. Lauderdale’s Anchor Yacht Sales. There was a third person as well. Seeing the need for a yacht that would be highly efficient over a broad range of speeds while at the same time offering standout comfort and safety, Chen brought aboard renowned marine architect Howard Apollonio. Apollonio had been evolving purpose-driven hull forms for decades, applying his ideas to everything from trawlers to superyachts. He added an immense knowledge base to the project, along with some serious expertise in hydrodynamics as well as tank testing. What resulted was the split-chine, semidisplacement Hampton Hybrid Hull, with its ability to produce superior operating efficiencies right alongside outstanding seakindliness. A unique set of upper and lower chines accomplished this synergy, nicely combining the advantages of a planing hullform with those of a displacement hullform, and providing excellent stability. I sea-trialed the 720 in the open Atlantic, straight offshore from Ft. Lauderdale, on a day that was rather rough and ready. But then again, the steady 20 knots of wind that was blowing, driving before it legions of 3- to 4-foot cresting waves of short duration, with an occasional “big boy” thrown in for good measure, generated a mixture of conditions that were perfect for evaluating the open-water performance of a fair-sized yacht. The boat handled like a champ. My six fellow passengers (three of whom were prospective owners) and I noted little if any of the usual ‘bucking’ motion that often prevails when busting headseas, a total lack of slamming in the errant big boys, no squatting aft in following seas, and no significant roll while abeam and running, whether the seas were on the port or starboard sides. 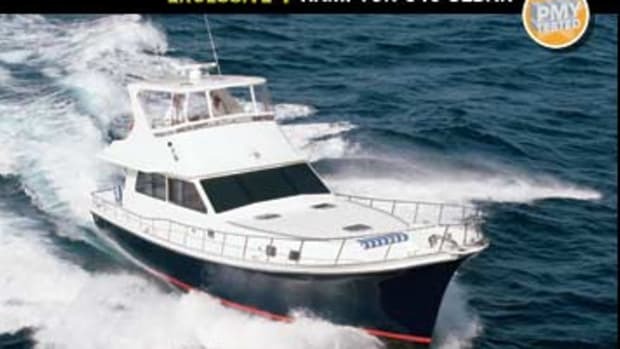 Facilitating all this, of course, were our Wesmar Three-Term Stabilizer fins and a pair of Caterpillar 1,150-horsepower C18 ACERT diesels, which generated an average fast cruise of 18 knots at 2000 rpm and a respectable 14.7 knots at 1750 rpm. 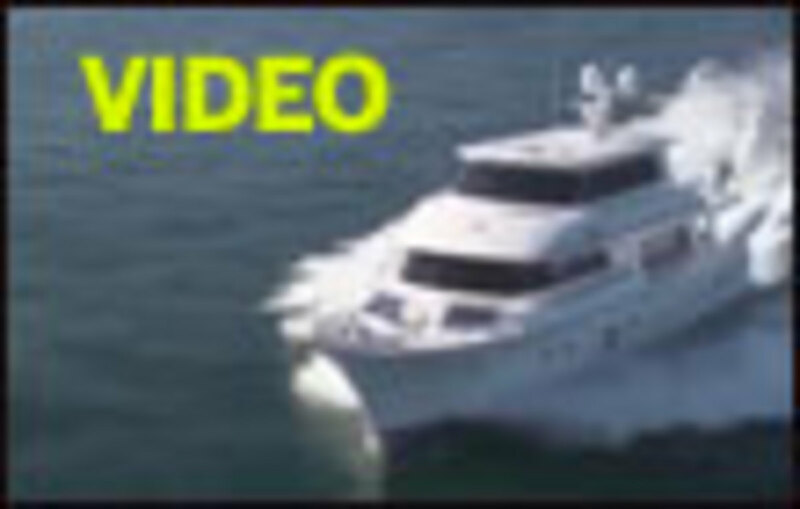 With Roberts at the wheel, I was able to stroll about while underway, examining every corner of the yacht, from the skylounge to the main deck, to the accommodations area below, including the crew’s quarters aft. Sound levels were generally low. Working closely with the sound-and-vibration-attenuation experts at Soundown, Hampton&apos;s technicians had installed thick layers of noise-deadening materials beneath the floors and in the bulkheads, especially the ones on either side of the engine room. Moreover, sound-deadening tiles had been layered over the prop tunnels, thus reducing the noise and vibration associated with blade turbulence at both low and high speeds. The results were sound meter readings that went from a mere 62 dB(A) at 1000 rpm, to a gentle-on-the-ear 69 dB(A) while at WOT. Robust construction? 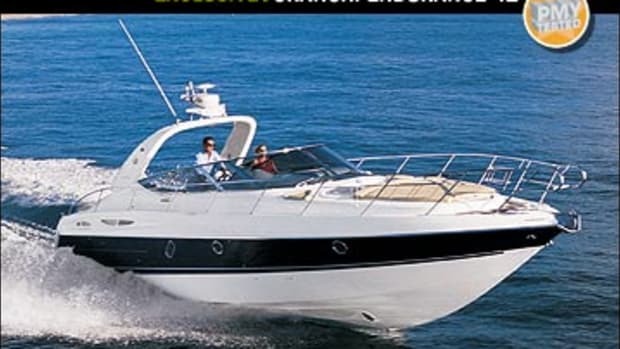 The 720 features a hand-laid solid fiberglass hull with Knytex or Cymax fabrics. Vinylester resin is used for the first 5 layers of the hull layup, with 2 layers of Kevlar from chine to chine and 3 layers in the forward collision zone. Deck, deckhouse, and flying bridge are all cored with high-strength Divinycell foam. The hull-to-deck joint is through-bolted every 6 inches, sealed, and secured with 3M 5200 sealant, and glassed over with 3 layers of fiberglass. Longitudinal and transverse members are molded FRP and interior structural components are thoroughly bonded to the interior of the hull. Due to the way she&apos;s constructed (see "Better Boat: Material Matters," right), the boat felt big, and as tough as they come. Bolstering this impression was the feeling of total solididity of the decks underfoot, as well the heavy-duty rails, cleats, and fairleads I could see during our test, carefully installed on the weatherdeck outside. 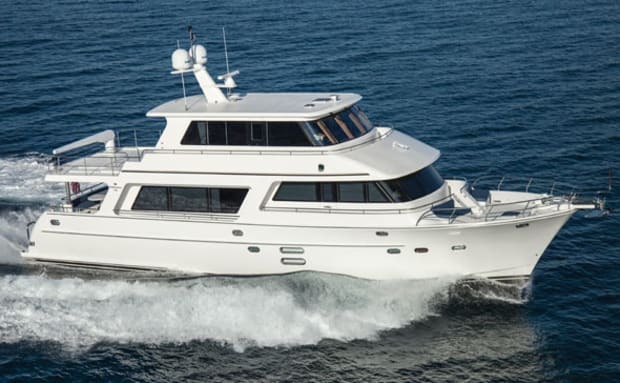 But for all her toughness and robustness, the 720 also offers an array of features and amenities, outside and inside, that truly put her on the radar screen of thoroughly relaxed comfort and luxury. 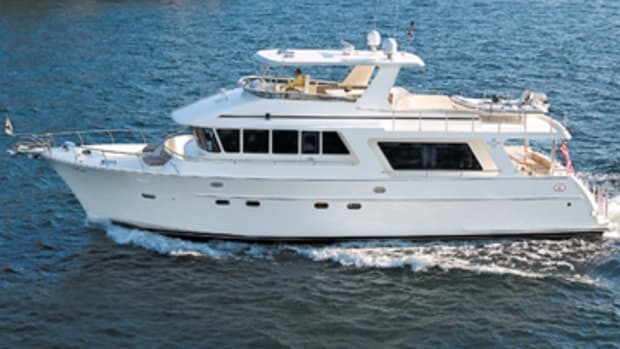 The straightforward, low-profile exterior design boasts a Portuguese bridge that bulwarks the pilothouse as well as wide-open anchor-handling spaces on the foredeck, with a comfortable good-weather seating area nearby. For ease in docking from outside the boat, I counted four standard, remotely-located ZF electronic engine control stations—two at the stern (port and starboard) and two at the wing stations up forward (also port and starboard). 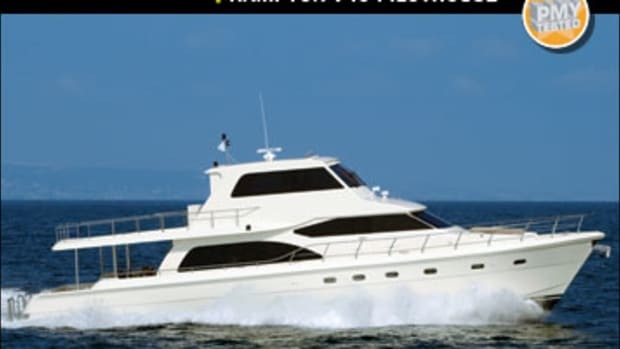 On the main deck, aft, there&apos;s a dining table with a grill and sink (a perfect spot for alfresco meals in sunset anchorages), while topside, there’s an aft deck (accessed from the skylounge or via a staircase) that is large enough for one of the few options on this boat: a tender. The only other big option is a watermaker, by the way. 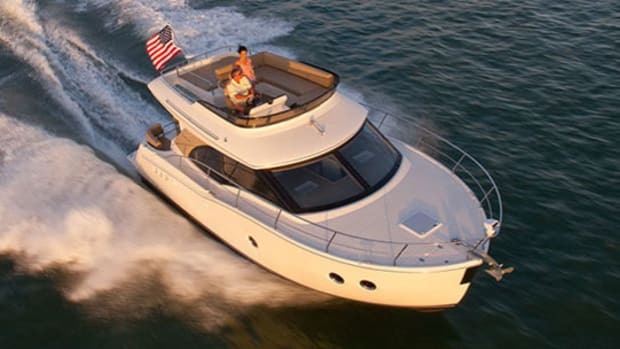 It’s amazing how complete the standards list is, quite frankly, including as it does a Garmin electronics package, Intellian HD 6 Sat-TV system, 1,800-pound HD Davit (with power turn and lift), and a ZF JMS joystick-maneuvering system. As mentioned earlier, sumptuousness is the interior&apos;s theme. As soon as you step inside you are greeted by a top-shelf fit and finish and an obvious attention to detail. 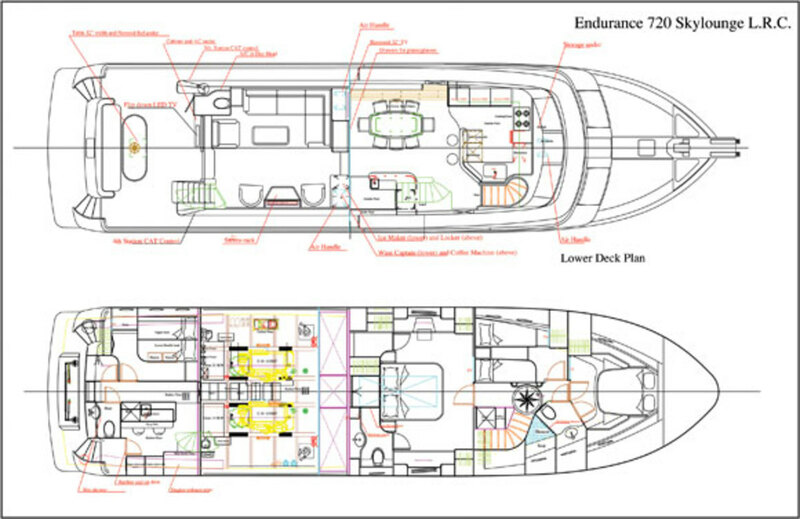 At the bottom of a wide staircase that communicates between the forward end of the saloon and the lower deck, the 720 features a four-stateroom, five-head layout. 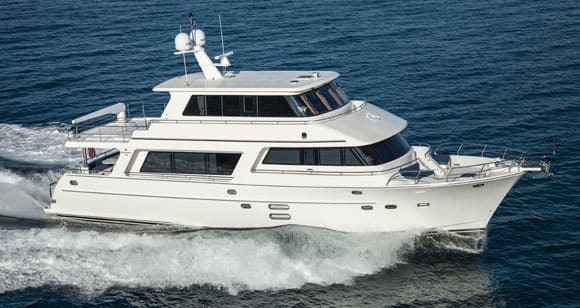 The forepeak VIP offers an island queen berth and cedar-lined closets, while an amidships guest stateroom (which shares a head with the VIP) offers side-by-side berths easily converted to a double thanks to a convenient insert. The full-beam master aft has an exceptionally decorative burl overhead, as well as a large walk-in, a cedar-lined closet, a bureau, vanity cabinets, and an ensuite head. The crew’s quarters, all the way aft, have upper and lower berths and a separate shower and head compartments, as well as a full galley. 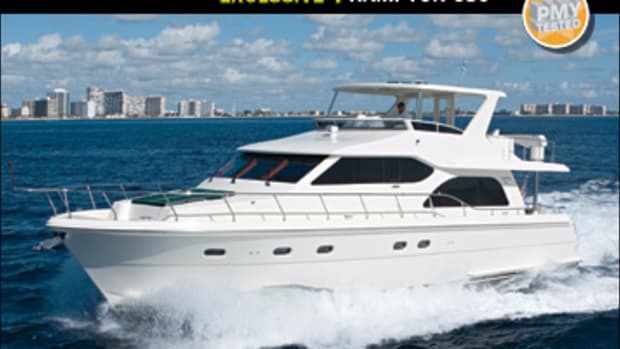 Exceptional, finely crafted woodwork, fine linens, and stowage areas ample enough for extended cruising prevail throughout. 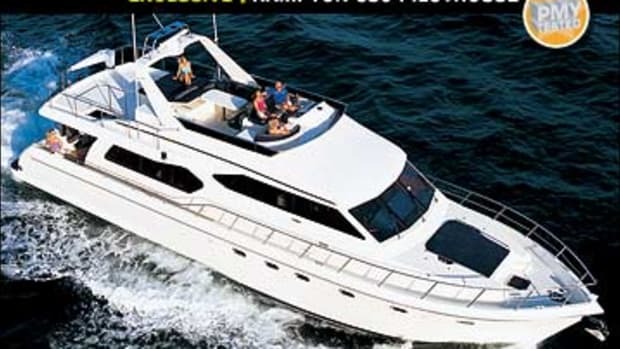 On the upper deck, the skylounge has a dining table as well as a helm station, a comfortable seating area, and a head. A beautifully crafted staircase leads down to the main deck, with its galley forward, bar to starboard, formal dining area to port, and aft, a lovely main saloon. 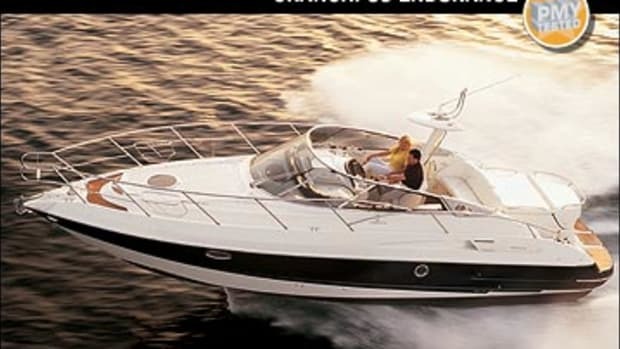 In the engine room, accessed via a large watertight door from the ample swim platform, or by descending the convenient staircase in the saloon’s aft starboard corner, I found the kind of forethought and common-sense features that sidestep any and all knuckle busting, knee slamming, and head knocking. While doing maintenance chores in the 720’s ER you’ll have no trouble getting to all the critical machinery, pumps, valves, hoses, and switches. And when it comes to safety? As I mentioned earlier, the 720 has plenty of redundant systems, including big duplex Racor fuel-water separators for each engine, a pair of 20-gallon water heaters with heat exchangers, two Kohler (28- and 15.5-kW) gensets, two Glendinning Cablemasters with 72-foot cords, a pair of Newmar 50-amp battery chargers, backup raw-water pumps for the air-conditioning system, hydraulic power-steering pumps on both engines, backup water supplies for each shaft log, and a special selector switch that temporarily combines the batteries aboard for 1,900 amps, just in case you find yourself needing a little emergency starting. Which is just the kind of feature that tells me this long-range cruiser has your back in a pinch. In fact, after my day aboard the Endurance 720EN, I was absolutely convinced—this boat is well-suited to take care of everything else as well. And that includes your all-important peace of mind while underway and a long way from home. 800 gal. fuel, 112 gal. water, 7 persons.